Do you know if Hungarian, Polish or such knights of eastern Europe wore the western European battle gear (Great-Helm, Mail, surcoat, arming-sword, axe, lance, etc...) during the second half of the XIII century, Or they looked like more Byzantine or Turkish soldiers? Do you know if Scimitar like sabers were used by such men at arms too? Do you know if the Anjou or Lorena Cross was common in their heraldry/ Surcoats? Polish knights were pretty 'standard' European Knights. 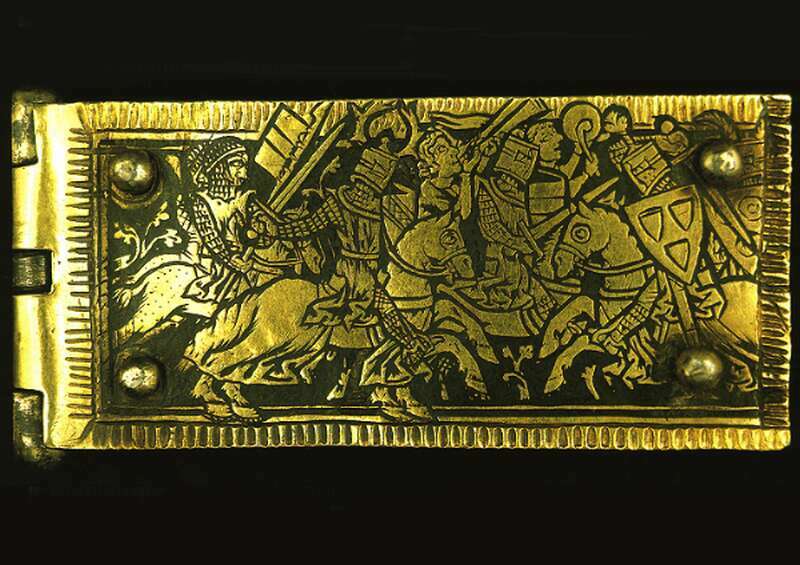 Of course some national and personal differences are always visible, but major oriental influences were visible in Polish arms after medieval had ended. "The word "scimitar", known in English since 1548, according to Wikipedia. And all curved swords that are hiding behind that meaning weren't really used anywhere in XIII century, and certainly not in Poland. That is a beautiful beltplate. Amazing detail. Where is this beltplate today? Wow. I have no words to describe it. It is so beautiful Zoltan, Excellent thanks it is awesome, even they have crests in their helms. Thanks, its really illustrative. i didn´t know that there were so nice beltplates. I would like to know where is it today too. Its awesome. Thanks Bartek, i always though that scimitars were slicing around during that century. About axes... Any ax in XIII century eastern Europe or saber? Thanks guys, your help is very appreciated. Do you think that this helm could be used during that time, or it is very advanced for XIII century? I think it is in the National Museum, Budapest. The plate is not so big, max. 4x 10 cm. The hungarian documents after 1241-42 are discrebing an armour and weapons for knighlty persons almost like the frankish doks from the Caroling era. King IV. Béla wanted quality instead of quantity. In the battle of Mohács fought a large number of western type heavy knights (f.e. the knights of the king's brother, Kalman, and those of the archbishop of Kalocsa, ab. Ugrin, and there were some templer knights with their 2-300 sergants or so), who caused heavy casualties to the mongols in nearfight, but mostly of them died on the b.field, after the tatars let the hung. middle and light cavalry to leave the b.field. After this the hungarian knights had to have lance, a shield, a good horse, "armour" (??) and a sword. The light cavalry: probably most of the hungarian riders (the hungarians usually had very few infantry) were light armoured. Certenly, when they had the opport. to get a chainmail or a helmet, they could transform them a little bit for their personal tactics. But they were wearing mostly just leather armour, or 3-4 greased leather kaftans at once. They used bows, and long, straight swords, and short lances. Hungarian szeklers, and the pechenegs and kumans: these groups (and other smaller parts os tribes/klans, f.e. uz torks, kazars, iazigs) they fought mostly just with light cavalry, F.e. the second generation of kumans used straight swords instead of the sabre. They hade to fought mostly against western warriors, so it was almost like in the antient rus, just in the opposit direction: the rus had to fight against the pechenegs, so they changed over to the saber. The lightcavalry in Hungary c.o. to the straight sword. Axe: I think the hung. heavy knights (the max. 5-6 000 man at once) used the common european one handed battle axe types. But the fokos (battle hammer with axe-head) survived until the 20th century, too. Sabres: there are some sabres on the homepage of Hermann-Historica. Tey are described as avarian sabres from the 9-10 th Centuries, but most of them (mostly the ones witl long blades and very peaked points are surely from the 11-13th Centuries. Thanks Zoltan, its good to hear that eastern Europe cavalry was such a great force too. I have the sensation that they most people do not imagine such knights when talking about eastern cavalry. Do you know guys if mail armour for the horse was avaiable too? What about the ¨tunic¨ covering the horses? Do you know if there is mail under them or if they are padded? Sorry, Rodolfo, I have (at the moment) no idea. With such a helmet is showed in or Picture-Chronic (from the 1360-70's) king Charles Robert of Anjou in the battle of Rozgony in 1312 and in the battle against the walachians in 1333. So almost 70-80 years after your epoch. I1ll see what I can find. Zoltan, you mentioned AB Ugrin, Do you know if Bishops fought and wore armour too? About Robert, Was Mail still used during the first half of the XIV century, or the coat of plates replaced the hauberk? And other bishops: certenly, all of the hungarian barones, weather from the curch or not, had to follow with a gaved number of soldiers the king in the war out and behind the borders. F.e. in the later times: Pal Tomori, the commander of the hung. troups by Mohács (1526) was some years earlier for a long time the bishop of Nagyvárad (today's Oradea, Romania), and even then he leaded the defense of the southern borders. Maybe this will sound stupid, but do you know if in 1526 Pal Tomori, wore armour, and lance, like the French Men-at-arms? It is really weird to see a Bishop wearing armour and fighting. Do you know any good tactic against mounted archers used by heavy cavalry lancers? As far as I know, fighting bishops weren't really anything weird in medieval. They were often man of wealth and power, with their own forces on battlefield, so if they were able, they often fought too. There is a topic here somewhere with the title Hung. cavalry by Mohács, but here is a page showing the first scene of the battle (ottoman painting). Tomori leaded with Imre Szapolyai, brother of the transilvanian voivod, the attack of the hung. heavy cavalry. Here are showed two hungarians, leading the attack, both in heavy armours. Sirs-It was my understanding that by the 12-1300's most wealthy eastern european knights, espically from the area of Austria and Hungary were armed like western knights, but most of their followers were Cumans and other turko-mongol tribes that had fled the Mongol conquest of Russia and the Ukraine and taken refuge in Hungary , Roumania, and Austria.I am glad to see this confirmed, I was not sure of the source. Do you know if infantry used pavises durign such time? The tribes you talk abouyt fought as mounted archers, or the became more like western infantry? The kumans got their right place in the hungarian army. (correctly the place of the szeklers, who had been moved from the west borders and central Hungary into a central settlement area in the East-Charpatians in the late 1100's and early 1200's, to defend the borders against the kumans:-), after the first little "State" of the german order was abolished and the Trans. saxons were settled down too. In the battle of Dürnkrut (1278) ther kumans leaded the first (and the last) hung. attacks(mainly used the bow), and raided the whole enemy-county behind the battlefield, the attacking bohemian lines were holded by the hung. middle cavalry (used bows too, but many of them had leatherarmour or chainmail, helmets, schield, lances etc, and the attack of the hung. (not very large numbered, but for these kind of tactic enough) heavy cavalry and after that the retireing kumans ended the whole story. The long bearded hung. commanders fought as professional as french knights (after the chronic-writer). But the hung. king commanded his troups from a near hill, like easter commanders. But it is true, large numbers of the hungarian riders used (even the knights) very often the bow. In the battle of Nicopolis (where Sigismund of Luxemburg wanted to use the same tactic (3 lines, 1. light cavalry (hung-s, walachians), 2. middle cavalry (hungarians), 3heavy cavalry (hung. barones, johannites, french, german and some english knights) against Bayezid), the french (who ruined the whole plan) complained the hungarians could just bowl along on their horses and shoot backward with their bows. In the 1430-s a french knight (traveling back from Jerusalem) had spend some days in Buda, where he saw a turnier in hungarian style, with smaller horses and shorter lances as usuall, and with hungarian "knightly" saddle, with low back saddle-bow. Hope I could help something. I think that we tend to imagine French, German and Spanish knights as the only professional knights, when Italy and Eastern Europe have pretty fearsome soldiers too. So for Hungarian Knights the use of the bow was no taboo. It is said that during XIII century knights wore coat of plates under the mail hauberk and surcoat, even mail can stop arrows very decently, but, How can a heavy cavalry formation (Without bows) crush a lighter cavalry armed with bows and such, like the Mongols? Hi Roldolfo- My sources,(history of Hungary) say that King Matthias Corvinus was the ruler that encouraged the rise of heavy cavalry, He also hired mercenary horse and foot from the free companies that fought in the hundred years war, Vlad Dracul (Dracula) tried to emulate him, the taxes he had to levy to arm heavy cavalry were part of the cause he was finally overthrown. Dracula did not rely on nobility, he used the old Greek tagma system where each free peasant family furrnished a man for the army, and they did not have the money for heavy arms. He defeated the Turks with this army a number of times, but his losses were heavy.